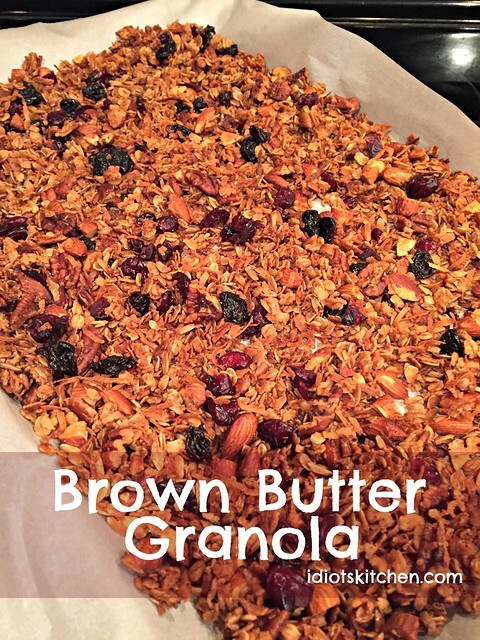 I was never a big granola fan until I started making my own. Store bought granola is always so hard and crunchy, way too sweet, and suffering from raisin overload. With homemade granola, once you get the hang of a few basic steps, you can customize it to include a variety of dried fruits, nuts, and extras. If you’ve never tried baking with brown butter, I suggest that you go remedy this crisis right away. Brown butter is the key to all things good and caramelly. 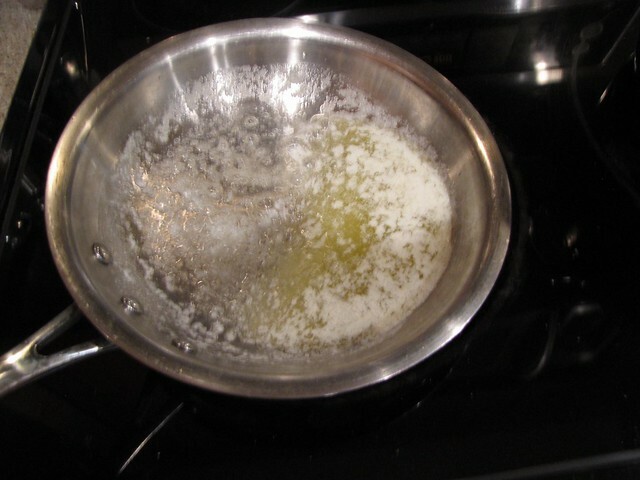 It is simply butter that has been melted and then as the liquids and fats begin to separate, the fats start to cook and gently turn golden brown. This releases the most delictable, toasty aroma. Your kitchen will never smell better. The only trick to making brown butter is to be sure you are attentive and have patience. Otherwise you might end up with black or burned butter and that is definitely not what we’re going for. If the butter burns, you have to throw it away and start all over. 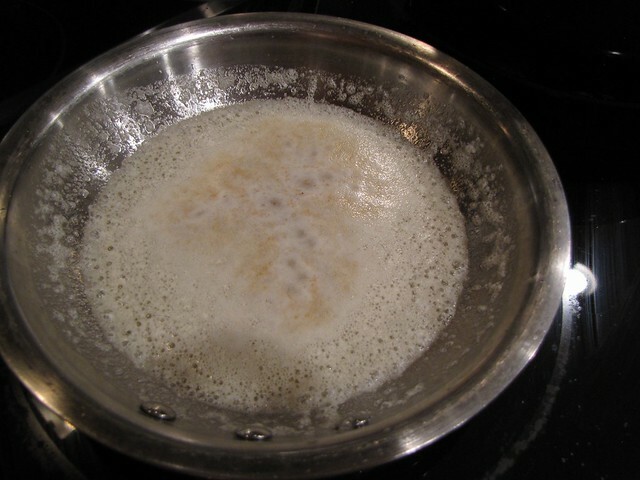 Melt ¼ cup (½ stick) of butter in a small skillet or sauce pan over medium heat. It will help you to see the browning better if you have a pan without a dark coating. As the it melts, give the pan an occasional swirl to move the butter around in the bottom of the pan. 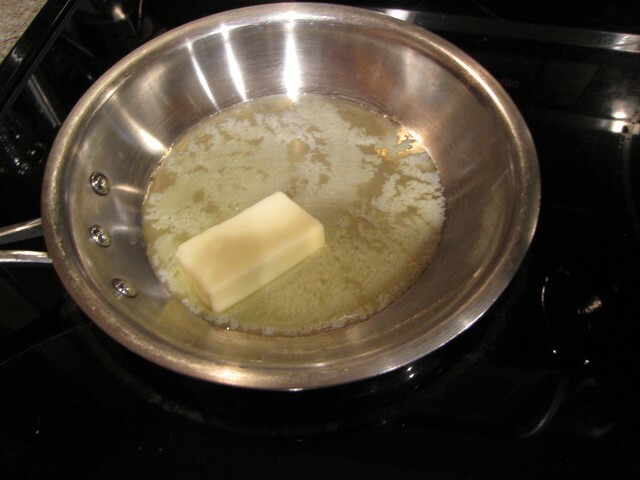 This will help you see the browning process and also keep the butter from scorching. You can see that as the fat separates out, the butter starts getting quite foamy. A few more minutes, still over only medium heat, and you can see golden brown patches developing. Keep swirling! Once it reaches a deep, golden brown, and smells very nutty and toasty, remove it from the heat and transfer the browned butter to a small bowl. You can see the deep brown color of the butter a little bit better in the bowl. I’m not sure why this was so incredibly foamy. 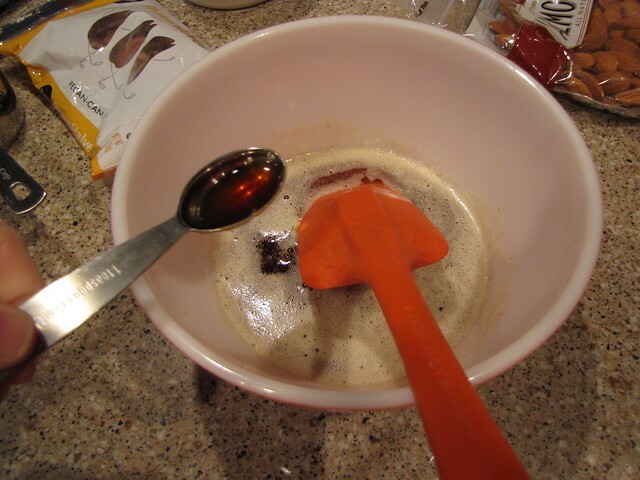 Add 1½ teaspoons of vanilla and ½ cup of pure maple syrup. Stir or whisk vigorously until smooth and well combined. The most difficult part of this recipe is not eating this browned butter maple sauce with a spoon directly out of the bowl. It tastes ridiculously good. 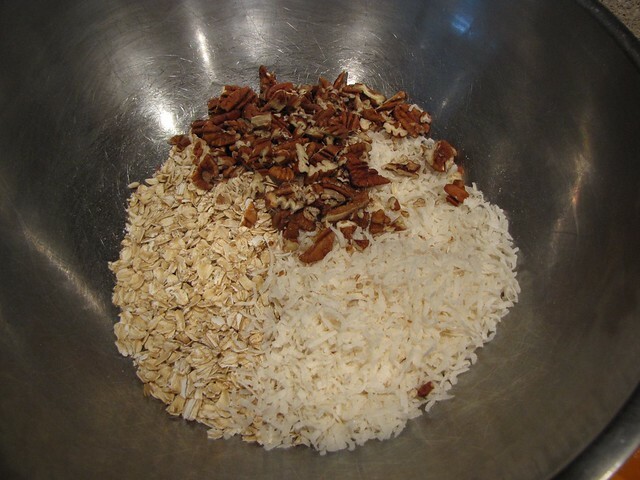 Assemble the dry ingredients for the granola in a large bowl. 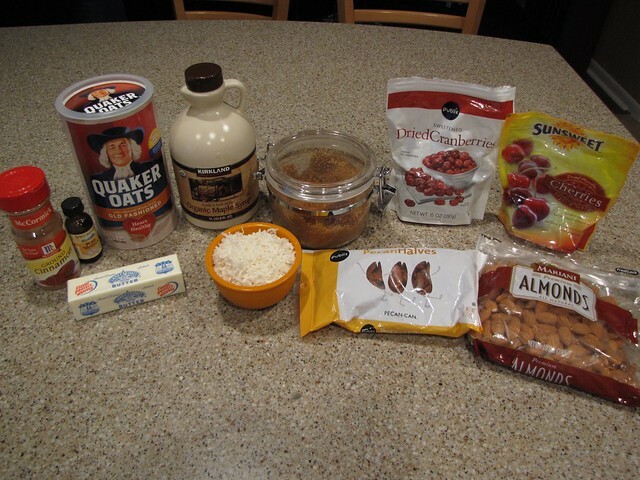 Combine 2 cups of old fashioned oats, 1 cup of shredded coconut (mine is sweetened), 1/2 cup pecans, and 1/2 cup almonds. Sometimes I like to leave the pecans whole but usually I give the nuts a very rough chop. 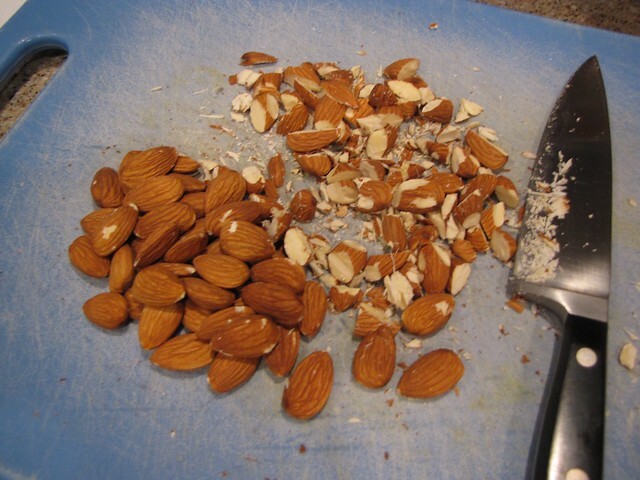 I want the nuts in big pieces so that they are recognizable and not tiny bits. 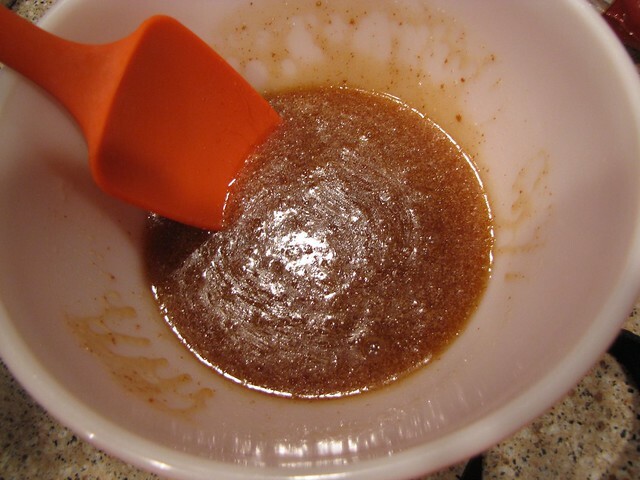 Add 2 Tablespoons of brown sugar, 2 teaspoons of cinnamon, and a pinch of salt and stir to combine the dry ingredients. Pour the browned butter maple sauce over the granola and stir until thoroughly combined. 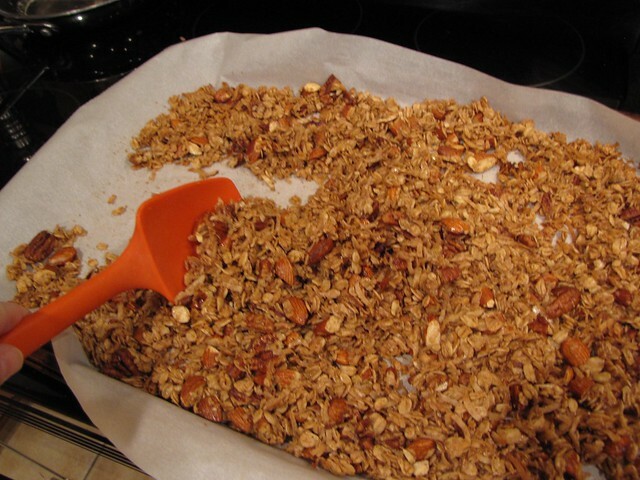 Cover a rimmed baking sheet with a piece of parchment paper and spread the granola out in an even layer. 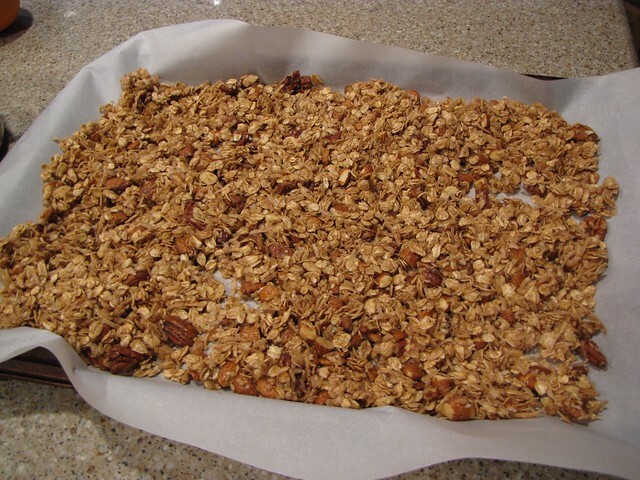 Bake at 300° for 30 minutes total, stopping to stir the granola every 10 minutes, or three times while baking. 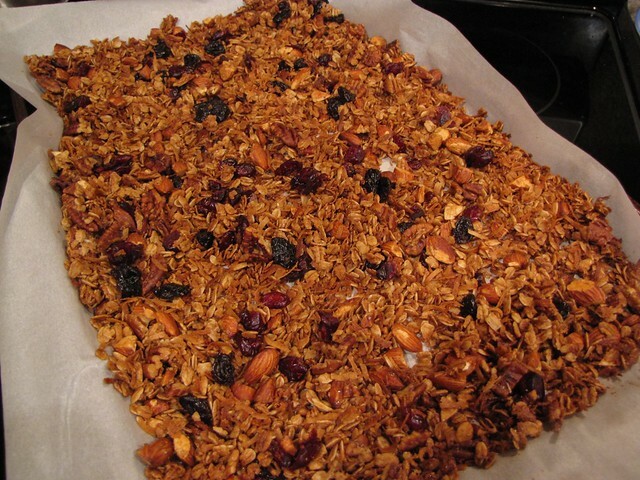 When the granola is golden and toasty, remove it from the oven and stir in ½ cup dried cranberries and ½ cup dried cherries. 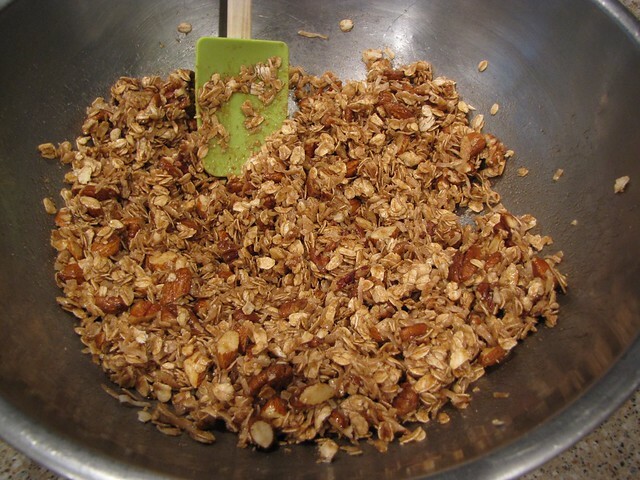 Allow the granola to cool completely (also a difficult task) and then store it in an air-tight container. I love granola sprinkled over yogurt and fresh fruit but also find myself just going and grabbing a handful of this in the middle of the day for a quick snack. You can also eat granola just like regular cereal with milk. Thanks to my friend Regina for sending this recipe my way. Brown Butter Granola makes a great addition to the collection of granola recipes here at Idiot’s Kitchen. You might also want to try Meredith’s Coconut Oil Granola and Maple & Almond Granola. Remember that you can change up the nuts and fruit to your liking or to use whatever you have on hand. Definitely try the brown butter! I have been lazy lately with so many things going on. How lovely does this look? VERY! We’ve been using Ghee and Brown butter for most everything these days. We bought it….didn’t think about making it; but hey, when I have an actual kitchen……I just might. I haven’t tried cooking/baking with Ghee yet. How do you like it?